Wenn es den Verfechtern der reinen Lehre des Serialismus und der Darmstädter Schule auch bis ans Ende der Musikgeschichte sauer aufstoßen wird: Mit der machtvollen Einfachheit seiner tonalen Musiksprache erreicht Arvo Pärt nach wie vor ein breites Publikum. 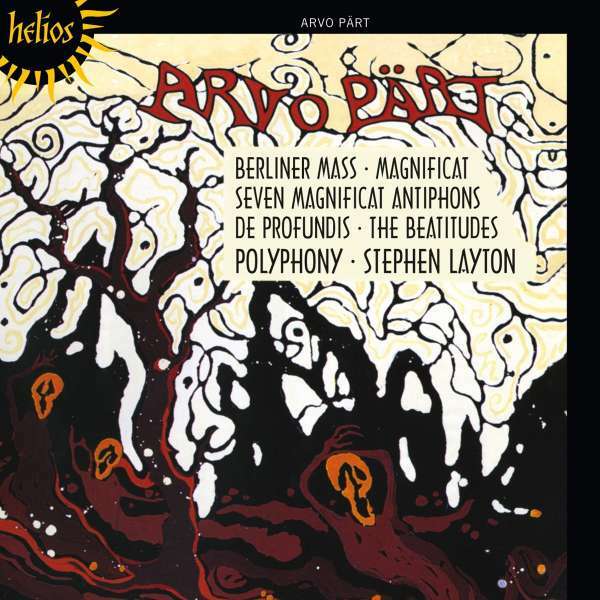 Innerhalb der Helios-Serie wird diesen Monat die hochgelobte Aufnahme einiger seiner Chorwerke mit Polyphony unter Stephen Layton wiederveröffentlicht. Here is some of the most spiritually uplifting music of our generation, sung by that most virtuosic of choirs, Polyphony. 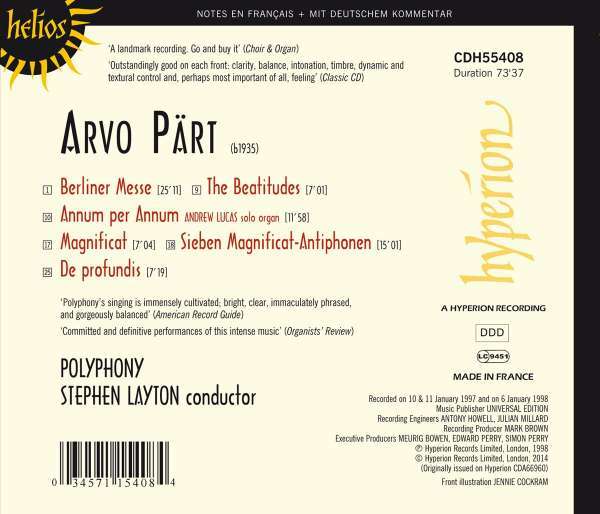 Arvo Pärt (paralleled in England by John Tavener) has succeeded in capturing the attention of a broad public through his consummate ability to weave a sense of inevitable power into music of fundamental simplicity. The impressive Berlin Mass which opens the disc was written in 1990, the Credo being a fascinating major-key reworking of the earlier minor-mode Summa; very much an expression of joy at the lifting of the Soviet embargo on 'sacred' music in Estonia. Annum per Annum is a monumental work for solo organ and is here performed on the organ of St Paul's Cathedral: a thoroughly exhilarating experience. 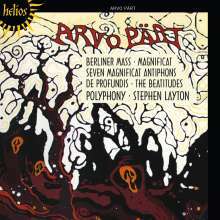 The disc ends with the masterpiece De Profundis. This most powerful of texts draws from Pärt an inexorable momentum from a beginning almost out of nothing to a devastating climax.